Where Data Security and Data Privacy Come First! CorrStat™ is the next evolution in controlling and using your health data. Your personal data is held in both technical and legal lockboxes. It is only visible to you! - Access the World's health. - Your private data is not sold off to advertisers. - Your data is used by researchers studying health related issues. - Researchers are not allowed access to the actual data unless you give permission. - No one but YOU has any idea who you are, You control your data. - Researchers can submit requests to CorrStat that allow the system to ask you if you would like to participate in a clinical trial, study, etc. - Earn rewards! A Bank Vault for Your Data! WaveFront's CorrStat technology keeps private information safe, secure and offline. At WaveFront we believe your private data is yours and uses Avalon Global Data Trust to keep it that way. Avalon is a non-profit charged with storing the private data generated by CorrStat. Avalon stores the private data encrypted at a separate facility not under WaveFront's control. Avalon cannot look at the data because it is stored encrypted with keys Members create. Research Package I – The base CorrStat analysis package. Research Package II – Research Package I plus Query ability. Monitoring service – CorrStat will allow Clients to set alerts sent to text and email. External Interface Access – Third-Party commercial enterprises such as IoT can create other services and Apps powered by the CorrStat platform. CorrStat Technology Licenses – Contact us. The newest App powered by CorrStat! Your studies may qualify for FREE CorrStat Analytics access! Areas of research are open to any studies. Special interest in neurological diseases and cancer studies. Include a description of your organization and your area(s) of research to see if your group qualifies. When is Data Security Important? "CorrStat is a cloud based encrypted data analytics platform that allows data to be used without revealing the data’s identity. The patient's health and lifestyle data is encrypted, stored and analyzed offline on a separate server system. In CorrStat, only the patient themselves can see their data and give permission to others to view it." Your data is protected by the CorrStat Technology Platform and Avalon Global Data Trust. CorrStat is an innovative technology leap that allows the sharing of data without revealing it. CorrStat utilizes advanced proprietary data storage, encryption, analytics, communications, and processing technologies. This "technology suite" allows your data to be shared within the system, but your data is not visible to the world. Members private information is unavailable to the Internet. CorrStat allows registered clients to send a message to selected populations, but the client does not know who got the request, how many people received the request, or if the request was ignored. Start your own business or App using the CorrStat API. CorrStat Respects and Guards Privacy! CorrStat utilizes advanced proprietary data storage, encryption, communications, and processing technologies. Member's encypted private data is held securely by Avalon Global Data Trust. Member's data is not sold, shared, or bartered with anyone else. Member's health data is available for use by the system, but the actual data is never revealed. CorrStat does not have an administrative interface and cannot access Member accounts. CorrStat is a "zero-knowledge" platform. Honesty - Deal honestly with everyone in our lives. We believe that by dealing from Integrity in all we do, we enrich our lives and the lives of those around us. WaveFront's goal is to allow the sharing of health and lifestyle data while protecting everyone's identity. We recognize that people have the right to benefit from their information while their identities remain private. Michael is the CEO of WaveFront and the creator of the CorrStat technology. His technology career has covered the spectrum from software development to management and marketing. In the mid-2000s he turned his attention to the Life Sciences with the goal of merging technology with science to make the process of discovering, researching, and developing health products quicker and more efficient. This led to the creation of WaveFront Clinical Management Services, LLC (WCMS) that had clients in San Diego and Boston. WCMS worked with companies in clinical trials to move their clinical documentation to electronic records. When the drug development pipeline slowed dramatically in 2009, he began work on the CorrStat technology. In 2010, Michael founded the Life Science & Technology HUB (LST HUB), a well regarded Palm Beach County, Florida 501(c)3 non-profit that is uniting the resources needed to grow the region’s life science and technology business ecosystem. BioFlorida joined with Michael shortly after he created LST HUB as a Supporting Partner. LST HUB now has HUBs operating in Fort Lauderdale, and Palm Beach. WaveFront Health Technologies, Inc's management team is comprised of seasoned professionals from the data communications, encryption, data, healthcare and clinical management industries. The Advisory Board is composed of biostatisticians, technology, business and life science professionals. One platform - many applications! CorrStat is an exciting technology that allows data to be analyzed without compromising the data's owner. So advanced it allows an analyst to query a data population in real time. The data storage software is a flexible data solution that also grows in real time. If data security and scalability is needed, The CorrStat Platform is the only solution built from a "security first" mindset. Security should never be an afterthought. Cosmos Continuum is the merging of Augmented Reality, Advertising and Data Privacy. Cosmos Continuum blends your message with the viewer's personality without invading privacy. Utilizing CorrStat's security infused architecture and the creative powerhouse of The Netherland's Studio Bleep, Cosmos Continuum is the next generation of messaging, advertising entertaining and gaming. WaveFront Health Technologies INC is a C-Corporation located in Palm Beach Gardens, FL. Investments in WaveFront Health Technologies are limited to accredited investors only. An Investment Summary and Executive Summary are available to accredited investors once they have completed an investor affidavit. 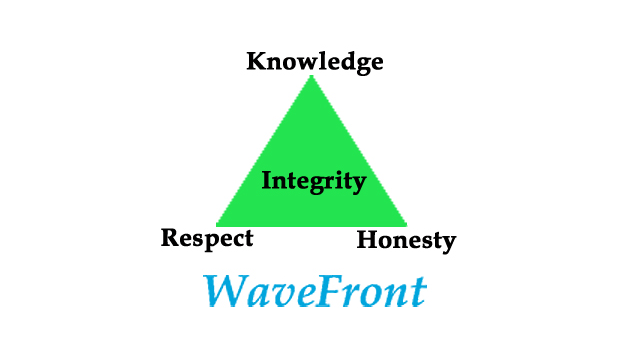 As a young startup we are looking for the right people to grow WaveFront into an amazing company. We will be looking for people in the areas of business development, software engineering, and marketing. Exposure or previous experience in the medical, advertising or life science industries is important. Keep checking here for more information when we begin hiring. WaveFront Health Technologies is located in Palm Beach Gardens, FL. CorrStat was envsioned during a conversation with a young cancer (Hodgkins) survivor. The person had contracted the cancer at a young age while pregnant. She related that while she was undergoing radiation and chemotherapy treatments she joined a cancer support group. The support group was helpful and not what she expected. Instead of a group of older individuals, she was in a group composed of mid-twenty aged women with newborn babies who had developed Hodgkins during their pregnancies (talk about some serious coincidences). She continued, "All of us who developed cancer while we were pregnant had Epstein Barr before the age of twenty". The first question was, "Who knows about this, who is researching this, what are the odds???" Her answer, "I guess, We do…". "We do"! With that one simple phase it became clear that the medical profession must be missing out on scores of stories like this one. Within minutes, the genesis for CorrStat was born, and the research and development to produce a system that would allow access to health and lifestyle data on a world wide network began. WaveFront Health Technologies, INC was formed in 2014 with a license to use the CorrStat technology. Since then it has grown into a secure data platform that supports multiple applications across a variety of industries without violating a person's privacy.